We continue the WW2-themed reviews, but this time it's a set of soldiers which we are going to review. The Esci Russian Soldiers! This is the original box. Typical Esci stuff, with a man portrayed very near and the rest in the background. 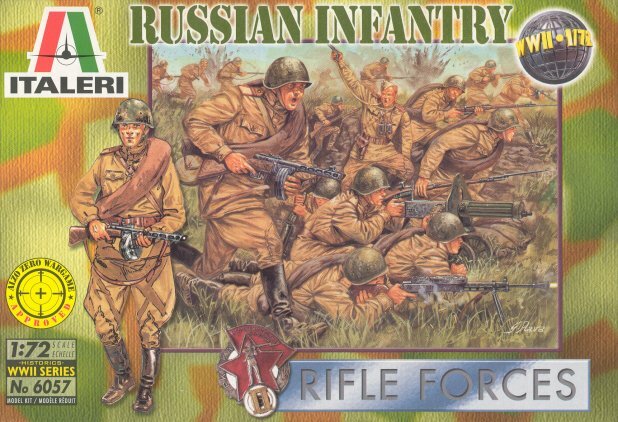 Quite good and all poses are really included inside (only exception the crouched machine gunner). This is the box of Italeri's reissue. I don't know why the "Rifle Forces" logo is there, just because there are so many riflemen? The artwork is depicting more action, but the colouring is a bit strange; they seem American infantry in the Pacific. The soldier outside the artwork looks strange and fat. These soldiers are very finely sculpted, with the usual perfect lifelike proportions Esci used to make. All detail is sharp, although, for example, I have my set bought in the mid-90s where detail is a bit blurred and not so sharp as always with Esci, and I have received some examples from eBay that were older and seem much sharper, so I assume that the originals had very good sharpness and the mould started to deteriorate with the years. I have no idea how Italeri's reissue is. These soldiers can be found in grey, military green, and a sort of tan-egg colour and probably more. 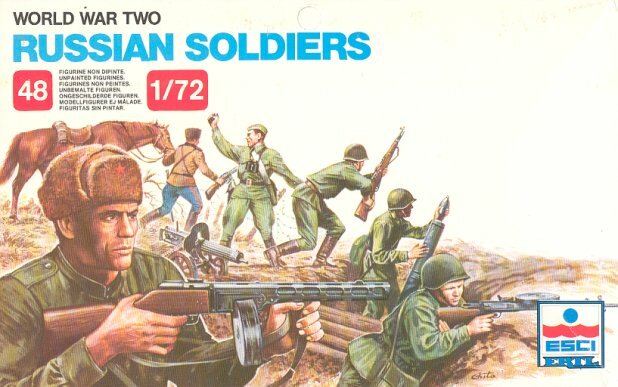 The poses are well chosen, maybe the mortar-man looks a bit silly holding two projectiles and looking at the camera at the same time, or the man throwing the grenade shouldn't lift his foot, but the rest are very lifelike and correct. You can't go much wrong with a subject that is 100 % researched, the maximum you could do is go wrong with pouches, weapon proportions, etc. And this time, Esci keeps the proportions very well , much better than usually when it gets a bit carried away with the firepower and gives too many machine guns. In WW2 is hard to reuse soldiers, and in this case, impossible besides reusing the horse. This set has very high funness . First, it gives a woman with a radio, which is both historical and a neglected subject by other manufacturers. Also, we are given a cossack with his horse, and although some people would prefer a cossack set and to leave this pose outside this one, in those days there wasn't a cossack set, so it was a good addition. As always, you have a leader, although strangely there is no unique man in this set (not that he is so much needed in a so standarized army, but maybe a general and a officer would have been better). The Maxim guns are also a very nice addition. Finally, there is the odd man holding his gun up, a bit like surrendering, or maybe celebrating, or simply drawing the attention of friendly troops from a distance. Maybe the most important thing that is lacking are some snipers, but representing in a general way the Red Army, this is an absence that can be understood. As we have commented, it has a very nice balance. The Cossack and its horse will be of little use, but you can always use it as a supply unit adding sacks to the horse. 46 men and two horses maybe looked a few compared with other Esci sets, but now it is a perfect quantity. You are also given 3 Maxims. You can get it shipped for 7 pounds, and at a similar cost in shops. If you keep alert on eBay, you'll find them second hand under the Esci name for even half this cost .